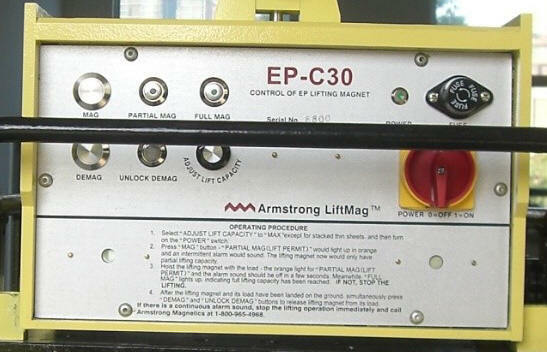 EP-C30 controls a magnetizing and demagnetizing current pulse for models of electro permanent lifting magnets or lifting systems which are comprised of two or more mains electricity activated electro permanent lifting magnets. It is different from the control box EPB-C30 which is for battery activated electro permanent lifting magnets. It is powered with mains electricity of single phase 180VAC-420VAC and outputs a few pulses of direct current to all modules of the electro permanent lifting magnets in the lifting system. Each current pulse lasts a given time interval. Operator can simply turn a knob at EP-C30 to adjust the magnitude of the current at 3 levels resulting different attractive forces to work loads. The lower level can be used to attract only one thin sheet metal a time from a stack, without clinging any additional sheets underneath. In order to get a maximum safety margin, EP-C30 outputs magnetizing currents two times activated by a signal issued from an electronic sensor. First magnetizing current is not strong enough to fully magnetize the electro permanent lifting magnets and only makes all modules of the electro permanent lifting magnets partially magnetized and therefore there is only a portion of the rated lifting capacity to the load beneath them. A few seconds after the lifting system being elevated off ground, the second and greater magnetizing current takes place. This time all of the electro permanent lifting magnets would get saturated magnetization and obtain full rated lifting power. So, if the lifting system can lift a load after the first and partial magnetization, it absolutely can lift the load safer after the second and full magnetization. After the first magnetization, an intermittent alarm sounds to remind you that the modules of the electro permanent lifting magnets are partially magnetized only and a portion of the rated lifting capacity is achieved. A few seconds after the lifting system lifted, the intermittent alarm stops. This indicates that the second magnetization occurs and the lifting system have full lifting capacity. On the contrary, if the intermittent alarm continues to sound, there would be a problem for the second magnetization which should not take place. In such case, it is dangerous to continue the lifting operation. You must immediately stop the lifting operation and have a qualified engineer to fix it, or contact Armstrong Magnetics. While the lifting system of electro permanent lifting magnets is lifted off of ground, a sensor instructs the EP-C30 not to output demagnetizing current to the modules of the electro permanent lifting magnets even if the DEMAG button is pressed accidentally. In other words, it is impossible to release the load from the lifting system when it is lifted. Operators can only release the load after the lifting system is laid down on the ground. EP-C30 detects the current values of the first magnetization, the second magnetization, and the demagnetization each time they occur. If any of them has not reached a set value, a continuous alarm would sound, and/or the light of “PARTIAL MAG”, “FULL MAG” would flash. 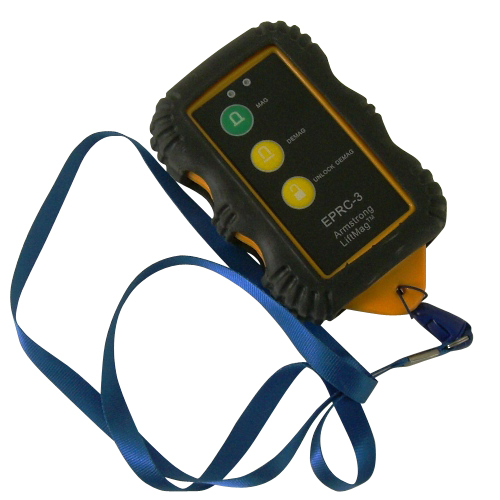 There is also an option for customers to have a wireless remote control EPRC-3 to operate the lifting system of electro permanent lifting magnets in a distance away from this magnetic lifting device. For any further questions about EP-C30, please send email to tech@armsmag.com.